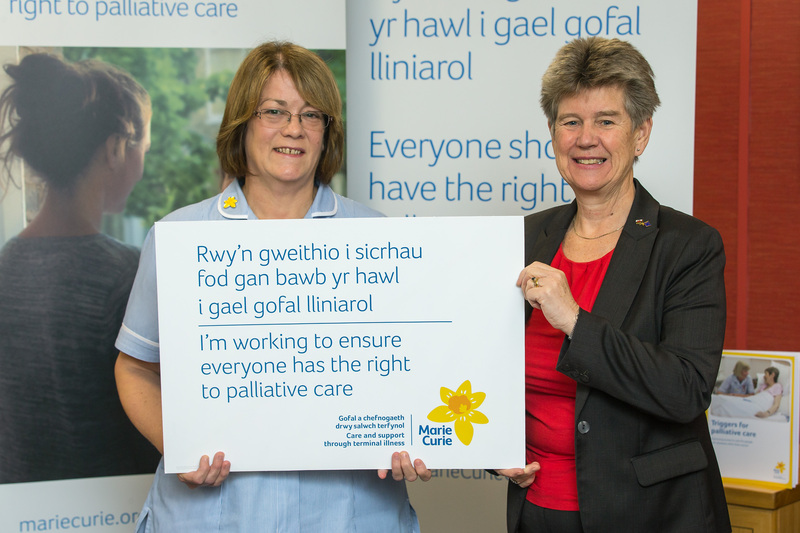 Vale of Glamorgan AM, Jane Hutt, has pledged to champion the concerns of local people with a terminal illness by lending her support to a Marie Curie campaign calling for the right for everyone to have palliative care when they need it. Jane Hutt AM teamed up with Marie Curie Senior Health Care Assistant Tracy Tucker at Ty Hywel in Cardiff Bay on Tuesday 17th November to back the campaign from the UK’s leading charity supporting people living with any terminal illness, and their families. Jane Hutt has pledged to help ensure that any constituents who have a terminal illness know what services and benefits they are entitled to; and work with local NHS services to improve access to and quality of palliative care for those who need it. In Vale of Glamorgan Marie Curie will soon be launching a new integrated Hospice at Home service in collaboration with Cardiff & the Vale University Health Board. The new service, which is set to officially launch in the New Year, will transform care for people living with a terminal illness by providing flexible, 24-hour care. The area is also home to the Marie Curie Cardiff & the Vale Hospice, a 30-bed unit providing specialist round the clock care. The hospice itself is host to a twice-monthly Carers’ Café, where carers can pop in for a cuppa, slice of cake and an informal chat about their caring role. Since opening in March this year, the café has supported more than 170 carers. The Marie Curie Helper Service, which sees local volunteers provide companionship and support for people living with a terminal illness, also operates in the area.